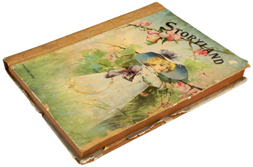 The history of pop-up books is fascinating. As with so many other types of children’s books, the first pop-up books weren’t for children. In fact, it wasn’t until the late 1700s (more than 500 years after the first one was created in the early 13th century) that pop-up books were first created for kids. Scholars were the only ones reading them before that. So why was the first pop-up book made? Read on to find out. According to historical records, it’s believed that the first volvelle (the term given to early mechanical books, based on the medieval Latin verb volvere, meaning “to turn”) was created in the mid-13th century by an English Benedictine monk named Matthew Paris. Paris created the book, Chronica Majorca, to calculate the dates of Christian holidays for a period of several years. Two other early examples of volvelles were books on astronomy. 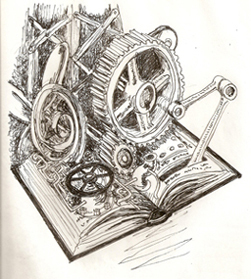 One was published around 1306, and contained a series of wheels attached together so they could spin. These “wheels” rotated to illustrate theories. Two hundred years later, in 1540, a similar type of book was created for Charles V, during his reign as Holy Roman Emperor. It was called Astronomicum Caesareum, by Petrus Apianus, and was full of nested circular pieces revolving on grommets (types of fasteners). The history of pop-up books took on a new look in the 19th century. By the mid-1800s, more sophisticated versions of these books were being created. Most notable were those by Lothar Meggendorfer. Born in Munich, Germany in 1847, he was an illustrator and writer who became well known for his humorously illustrated pop-up books. The intricate series of rivets and levers he used made it possible for his illustrations to each have several different types of movements. Each year, the Movable Book Society bestows an award named after Meggendorfer to one new pop-up book. Movable books remained popular in Germany and Great Britain for the remainder of the 19th century and into the early 20th century. But with the advent of World War I, their popularity faded. It wasn’t until the years between World War I and World War II that these books grabbed the interest of Americans. Once again, the history of pop-up books was changing. Elaborate examples of these “paper-engineered” books arrived with the Bookano series of books in Great Britain, and through Blue Ribbon Books, Inc. of New York. After World War II, no one seemed very interested in movable books any more. Until Waldorf (Waldo) Hunt came along. To this day, no one else in the history of pop-up books has made such an impact on this genre of children's literature. In 1965, he started a company called Graphics International, through which he produced a series of pop-up ads featuring zoo scenes as part of a magazine campaign for Wrigley’s gum. Eventually, the company began creating pop-up table decorations and greeting cards for Hallmark. Soon after his company was sold to a bigger company in New York, Hunt was walking down Fifth Avenue when he noticed a children’s pop-up book from Czechoslovakia displayed in a toy store window. He realized he’d stumbled upon a goldmine. No one was publishing pop-up books in the United States because of the expense. But with his expertise and marketing experience, his ability to coordinate with designers and paper engineers, and his own imagination, he knew he could make it work. In 1974, he started a new company called Intervisual Communications, Inc., through which he began packaging pop-up books for major publishing houses. He also produced several books for Walt Disney. Thanks to Hunt (and more recent paper engineers), even Disney can now be considered part of the history of pop-up books. Robert Sabuda, one of today’s best known paper engineers (the name commonly given to today’s creators of pop-up books), believes that if it hadn’t been for Waldo Hunt, the art of pop-up would have died out again in this country. Learn about different types of pop-up books on the market today, and the paper engineers who make them, at my Pop-Up Books for Kids page.